JOSEPH A. CAMPBELL is an attorney specializing in criminal and drunk driving defense law throughout Metro Detroit and the state of Michigan. Growing up in Macomb and Wayne County, Joseph A. Campbell is a passionate advocate for the people within Metro Detroit’s diverse communities. Joseph graduated with his B.A. in Social Relations and Policy from James Madison College at Michigan State University, and then went on to graduate at the top of his class from Wayne State University Law School. While at Wayne Law, Joseph was elected by his peers to serve as Student Governor for the class of 2017. Prior to graduating from law school, Joseph served as a judicial intern for the U.S. District Court, Eastern District of Michigan. Sterling Heights: Arguing the issue of "possession" on behalf of a client ​charged with a drug crime ​that was merely a passenger in a vehicle. Clinton Township: Successfully advocating for a client to receive a lighter sentence on repeat DUI, avoiding jail and harsh terms of probation. Macomb Juvenile Court: Authoring a ​successful ​deviation ​request ​in a Macomb County ​juvenile ​terrorism case​ which resulted in reducing the charge from a felony to a misdemeanor. In a second such case, obtaining a consent calendar dispositioin which will result in NO criminal record for the juvenile. ​Macomb Circuit Court: Co-chairing a felony domestic violence case and preparing a brief to facilitate cross examination of the alleged victim. Prosecutor dropped the felony on the date of trial and client received a light sentence of probation and avoided a felony conviction. Clinton Township: Getting a retail fraud reduced to a misdemeanor “disorderly conduct” for a client with a habitual larceny record. Roseville: Obtaining a deviation to get a felony drug charge dropped and reduced to a misdemeanor saving the client from losing his important rights to possess firearms. Joe is the best. He represented me for my 2nd DUI. I actually had a better outcome on my second DUI then my first . He went above and beyond to make sure that everything was fair and help me progress in my life. 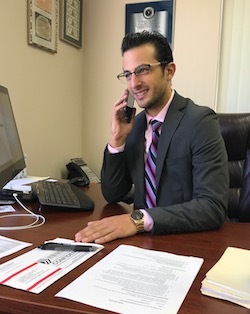 If you need a good lawyer you should call Joe at ABDO! Hands down the best law firm around! Cy, Matt, and Joe went to bat for me when I was facing a 14 year felony and got it reduced to a misdemeanor with no jail time and only fines. I am so thankful I contacted them first. I can never thank them enough. ABDO LAW gets deals that nobody else can. Whether a traffic ticket or criminal case, these guys make it happen. Today, Joe represented me in Shelby Township and got me the best deal possible. Even the judge told me that Joe worked out the best deal possible. I’ll be recommending ABDO LAW to everyone! Adults, Juveniles, First Time Offenders, Habitual Offenders, Out-of-State Residents and Canadians. Conducted legal research for indigent patrons on issues including but not limited to determining section 8 eligibility, interpreting Michigan Court Rules for case preparation, and explaining patrons’ due process rights. Founder of Greater Detroit Coalition, a nonprofit organization based out of Detroit’s Lafayette Park neighborhood with a mission of uniting and empowering Metro Detroit youth to achieve their dreams.